The Drawing Pivot tool lets you set the pivots on your character. You can set the drawing pivots on drawings and symbols. 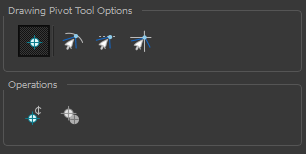 The Set the Pivot for Symbol on All Frames option is enabled by default. When you set a drawing pivot on a symbol, all of its cells use the same drawing pivot. This means you do not have to set a drawing pivot on all frames. Once you set it, it is done. If you prefer to set a different drawing pivot for a series of cells, you can deselect the option and set your pivots on each cell or cell range. NOTE: If you have already set several different pivots on your symbol's cells and selected the Set the Pivot for Symbol on All Frames option, once you set a new pivot on the same symbol, all of its pivots will be reset and will use your new pivot. When you drag the drawing pivot around, you can enable a snap option so that when the drawing pivot is released, it either snaps to the reference grid, drawing's contour, or aligns with an existing drawing stroke. When you click the Reset Pivot option, the drawing pivot of the selected drawing or symbol is reset to the centre of the Camera view. When you import new extra drawings, such as hands and mouths, you can use the drawing pivot that was set on your drawings and report them to the symbol's cells. Use the Copy Pivot to Parent Symbol command for this. NOTE: When you copy drawing pivots to the parent symbol, there is no link between the drawings' pivots and the symbol's pivots. If you modify the drawing pivot later, it will not link to the symbol. You would need to perform the operation again. If you need to modify the symbol's pivots, you can do it directly on the symbol's cells.